The first thing you need to do is Download Roxio Creator. Place the DVD you want to extract video from in your computer’s DVD drive. 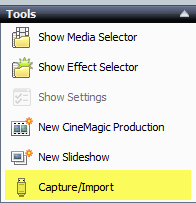 In the video editing portion of Roxio Creator, click on Capture/Import. Here is how to import video clips from your DVDs in a few simple steps. 3) Choose a video import setting (I recommend sticking with the MPEG default, which is compatible with the video on your DVD). 4) Choose a place to your hard drive to save the files. 5) Click Import Now to start importing video from the DVD. Depending on how much footage you’re importing from the disk, you may have to wait anywhere from about 60 seconds to several minutes. After you finish importing the video from the first DVD, import the clips you want to use from the second DVD repeating the steps above. When you finish importing all the video you need, add the clips to the video editing timeline and export the whole project as a DVD.